do you know if software updates will come to the 16 for intouch/ UI enhancements? Re: 2016 vs 2017 QX60 Theatre package and others... advice..
You may be talking a price difference of a few thousand dollars. To me, when watching video on a smaller screen, it has to be a good story to get absorbed into the film. When absorbed, you pay attention to the plot, not the screen resolution. This can change if you're playing video games. Now, the new screens and old ones are very close in spec. Some say normal human eyes can't detect the difference. Well, why pay thousands more for a barely detectable difference? I don't know but people do it every day, especially with smart-phones and TVs. Headphones? They get better each year and don't cost thousands. I wouldn't pay a dime extra for Infinity factory OEM headphones. I looked around and read people aren't impressed with the Theater package, but wanted other stuff so they got the package anyway (dealerships love this). You might look into the input options. People seem to have to add HDMI adapters to connect some devices. Updates have been kind of standard in the industry and I think you can safely assume/ anticipate future updates for each of these vehicles. For me, if I was into this stuff at all, I'd have to determine the difference in price (probably just some online research) and the difference in quality (visit both cars, sit in the passenger or back seat and watch a cartoon or whatever). Well, I agree 100%, the user interface is key to enjoyment and function. I'd still compare the UI between the two and then add that few grand in price to see if it's worth it to yourself. The photo you try to share doesn't work. I checked the link you put in there and it's not going to work that way. If you have a google photo in a personal account, I don't think others can see it without logging in. Also, I don't think google does the embedment thing at all for forum threads like this. You might look into sharing the folder on an image hosting site and getting the URL from there to embed it. 2nd attempt to embed image. That works! It looks like the first pair (the maps) shows a little more clear on the right, I'm not sure if that's due to the camera, the photo or the actual display though. The second pair shows to different screens, so it's tough to compare the UI. The second one looks 'prettier', but they both just seem to have touch screen 'buttons'. Three vertical 'buttons' vs four horizontal 'buttons' doesn't seem more clear or easier between the two. 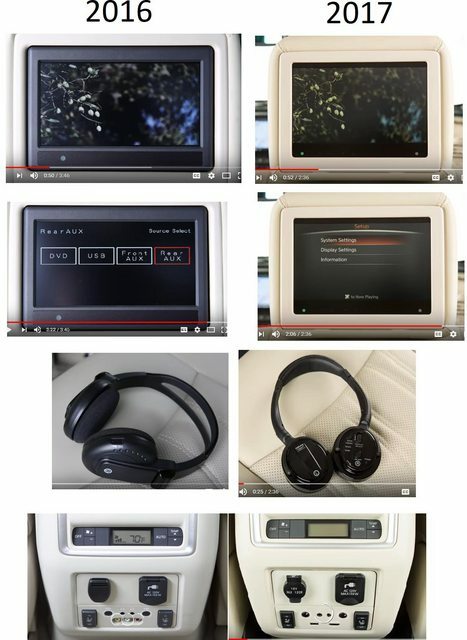 Headphones look comparable and that last pair of climate controls seem nearly identical. What differences do you notice, like or dislike? Have you sat in both and played with the stuff? Ive sat in both and played with both. But in reality, didnt notice the UI and differences until watching youtube reviews. I'd be interested in those extra source inputs. That's a definite improvement in my opinion. Tech people rip into UI's all the time in their reviews. They really get into it. It's interesting, not always useful and the opinions can be vary widely from those of an average user. They do get to the nitty gritty though and have good ideas. Again, I'd have to weigh that in against costs and the lifespan of the vehicle. Sometimes extra money just sounds extra, but when you consider the product lasting 10 years and the level of use/ enjoyment, then it becomes reasonable instead of extra.